MANILA, Philippines – DoubleDragon Properties Corporation has partnered with Ascott Limited to build a 5-star luxury serviced apartment in Pasay City, targeted to be operational by 2020. DoubleDragon, a joint venture between a firm of Edgar "Injap" Sia II and Tony Tan Caktiong's company, told the local bourse on Monday, June 19 that this luxury serviced apartment will serve as the third phase of its flagship project, DD Meridian Park, located at the Bay Area, corner Macapagal Avenue and EDSA Extension, Pasay City, Metro Manila. Named as Ascott-DD Meridian Park Manila, this development will sit on a 5,567 square meter lot within the 4.8 hectare complex of DoubleDragon and is set to have over 300 units. 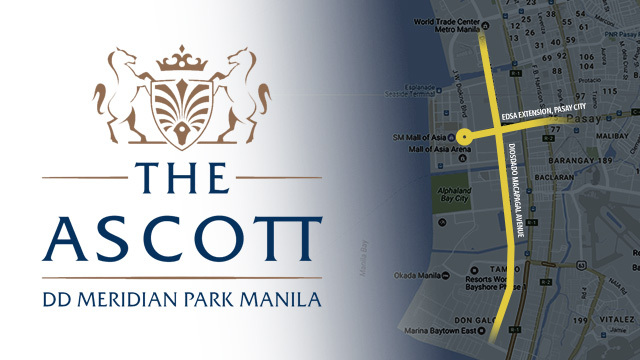 "The location of the upcoming Ascott-DD Meridian Park Manila is very ideal for the project given its close proximity to the Manila Domestic and International Airport, Department of Foreign Affairs, Mall of Asia and the Entertainment City," DoubleDragon chief information officer Joselito Barrera Jr. said in the disclosure. DoubleDragon said the construction of Ascott-DD Meridian Park Manila is set to break ground by end-2017. Its subsidiary, DD-Meridian Park Development Corporation, signed an agreement with Ascott on Monday, June 19 for the 5-star serviced apartment. Ascott is a member of CapitaLand, one of Asia's largest real estate companies. Headquartered and listed in Singapore, it owns and manages a global portfolio worth more than S$78 billion as of March 31, 2017. The 4.8-hectare DD Meridian Park will consist of 8 towers that is expected to have about 230,000 square meters of leasable space. The first phase with 4 towers named DoubleDragon Plaza is set to be completed by the last quarter of 2017; while the second phase, DoubleDragon Center-East and DoubleDragon Center-West, is expected to be done by end-2018. The development of Ascott-DD Meridian Park Manila is expected to further enhance the profile of the entire development and "meaningfully contribute to the recurring revenues of DoubleDragon," Barrera said. In 2016, DoubleDragon saw its net income more than double to P1.47 billion, after its recurring revenue almost tripled. It marked a major milestone for DoubleDragon after it breached its P1-billion net income target for 2016, which it committed when it went public 3 years ago.